A cast iron stove is a device, built from a material consisting of iron mixed with carbon, in which a solid fuel such as wood or coal is burned to produce heat for warmth or cooking. The stove usually consists of a grate, which holds the fuel, a hollow interior in which the fuel burns, flues through which hot air flows, and baffles to slow down the flow of hot air, allowing the stove to produce more heat. Human beings have burned wood and other natural fuels to provide warmth and to cook food since prehistoric times. At first, open fires were used. A major drawback with this simple method was the fact that much of the heat of the fire was wasted as it escaped in the form of hot, rising air. Prehistoric people soon learned to build the fire against a flat rock standing up in such a way as to reflect back heat. For cooking, the fire could be used to heat a pit dug into the ground or a hearth made of thin, flat rocks. The ancient Romans developed a heating system known as a hypocaust, consisting of a series of flues beneath a tiled floor, which carried hot air from a fire to all parts of a room. A hypocaust could also be used to heat a cauldron of water for cooking or bathing. Similar systems of heating are still used in China and Korea. Despite the early development of this sophisticated device, until the Middle Ages most Europeans relied on open fires on a central hearth beneath a hole in the roof to let out smoke. Fireplaces with chimneys began to appear in castles in Northern Europe around 1000 A.D. For hundreds of years, fireplaces were limited to large houses owned by the wealthy. In England, as late as 1600 A.D. , fireplaces were still fairly uncommon. The wealthiest homeowners had fireplaces with chimneys made of stone or brick, while the less prosperous had fireplaces made of mud and wattle. Wattle, a material consisting of vertical wooden rods or poles interwoven with horizontal sticks or reeds, was dangerous because it was flammable. Despite this hazard, mud and wattle chimneys were common in the United States as late as 1800. Fireplaces were not much more efficient than open fires because much of the heat went out the chimney with the hot, rising smoke. Small fireplaces with gently burning fires were more efficient than large fire-places with quickly burning fires. A device known as a curfew, consisting of a sheet of brass or tin, could be used to limit the flow of hot air, resulting in a steady, slowly burning fire. Curfews were used to keep a fire burning throughout the night without being tended. The first stove to appear in historical records was built of brick and tile in 1490 in Alsace, a part of Europe on the border between France and Germany. In Scandinavia, stoves were built with tall iron flues and iron baffles. In Russia, stoves as large as 8 ft (2.4 m) tall containing as many as six thick-walled masonry flues were placed at the intersection of walls to heat four rooms at once. Cast iron was first produced in China in the sixth century B.C. and in Europe during the twelfth century, but it was not used to any great extent until the seventeenth century. The first cast iron stove was manufactured in Lynn, Massachusetts, in 1642. 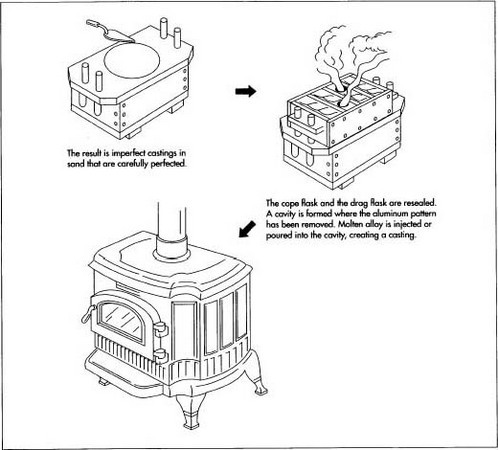 Early cast iron stoves consisted of flat rectangular plates bolted or pinned together to form a box. The plates were made by pouring molten cast iron into molds made of sand, a method still used today. In 1744, Benjamin Franklin invented a more efficient cast iron stove known as a Pennsylvania fireplace. This device controlled the flow of hot air so that the smoke from the fire burned more completely, resulting in the release of more heat. This design was extremely successful and is still used today. 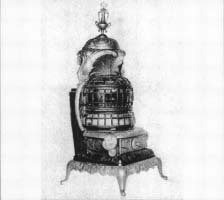 A more complex device invented by Franklin in 1786 was not as successful, but its design anticipated modern cast iron stoves, which burn almost all the smoke from the fire. Cast iron stoves remained mostly unchanged in basic design for about 200 years. In the 1970s, large increases in the price of heating oil led to an increase in the use of woodburning stoves. The pollution produced by these stoves led the Environmental Protection Agency (EPA) to issue regulations in 1988, which required all newly manufactured woodburning stoves to meet standards for emissions. Stove manufacturers developed improved technology to produce cast iron stoves which were highly efficient and which produced very little pollution. Cast iron is a substance consisting of iron and between 2-4% carbon. Various small amounts of silicon, manganese, sulfur, and phosphorus are also present. For special applications, various amounts of nickel, chromium, and molybdenum may be included to produce cast iron which is resistant to heat, wear, and corrosion. A modern cast iron stove may contain as little as one-third cast iron. The rest of the stove consists mostly of steel. Steel is a substance consisting of iron and, in most cases, between 0.01-1.2% carbon. Some special forms of steel may contain as little as 0.003% carbon or as much as 2% carbon. Steel may also contain various amounts of manganese, silicon, aluminum, nickel, chromium, cobalt, molybdenum, vanadium, tungsten, titanium, niobium, zirconium, nitrogen, sulfur, copper, boron, lead, tellurium, and selenium. A cast iron stove produced by the Michigan Stove Co. in 1882. Many of us lick our lips at the thought of waking up to a farm-style breakfast made on a cast-iron kitchen stove. After the 1850s, stove manufacturers produced large models on which a farmwife might cook bacon, eggs, hash browns, and corn beef hash on top, with cinnamon rolls rising in the stove. The position of the burners on these stoves dictated the temperature of the burners, so the cook knew the best burner for "simmering the coffee." Since there was no thermostat on the stove, the cook learned to regulate the temperature based on the look and feel of the fire (wood or coal, depending on the model). Cast iron stoves were also used to keep rooms warm. Fireplaces are notoriously inefficient ways to heat rooms without central heat. By 1860, many families boarded up the fireplace and put a parlor stove like this one on the hearth and vented the stove through the chimney. This "art garland" model was so called because of its decorative cast iron scrollwork, nickel, and fashionable shape. Produced by the Michigan Stove Co. in 1882, it includes isinglass, or sheets of thinly-sliced mica, which serves as glass in the iron grills in front so that one could see the glow of the flames but not feel the full intensity of the heat. 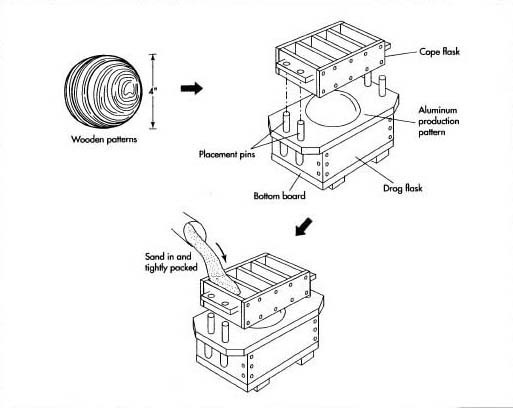 The stove is formed through a process called sand casting. Once sand is hardened into a mold in the shape of a stove, molten cast iron is poured into the cavity and allowed to cool. and platinum or palladium (metallic elements used in catalytic converters which cause smoke to burn at a lower temperature, resulting in the release of less pollution). 1 Iron ore is dug out of the earth in surface mines. The ore is obtained in lumps ranging in size from more than 40 in (1 m) in diameter to less than 0.04 in (1 mm) in diameter. To produce cast iron or steel, the lumps must be 0.3-1 in (7-25 mm) in diameter. Lumps of ore, which are too large, are crushed and pass through sieves, which separate the resulting material by size. Lumps that are too small, known as fines, are melted together into larger lumps, a process known as sintering. pig iron, which consists of at least 90% iron, 3-5% carbon, and various impurities. 3 The molten pig iron is poured into large molds and allowed to cool into a solid. It is then mixed with scrap metal, which has been selected to give the mixture the desired combination of raw materials. This mixture is moved by conveyor belt to the top of a cupola, which resembles a small blast furnace. The pig iron and scrap metal fall on a bed of hot coke through which hot air is blown. This process removes the impurities and a small amount of the carbon, resulting in molten cast iron. 4 Cast iron, as its name suggests, is usually shaped by pouring the molten metal into a mold, a process known as casting. The most common method is known as sand-casting. A pattern in the shape of the desired final product is shaped form wood, metal, or plastic. It is then firmly packed into sand held together with various substances known as bonding agents. The sand is hardened by heat or by chemical bonding with various substances known as bonding agents. The sand is hardened by heat or by chemical bonding produced by including sodium silicate in the original sand mixture. After hardening, the pattern is removed, leaving a cavity in the sand. Molten cast iron is poured into the cavity and allowed to cool, resulting in solid cast iron in the desired shape. 5 Cast iron components and steel components are shipped from the iron and steel company to the stove manufacturer and inspected. Before assembly, the cast iron components must be polished. A surface grinder is used to remove about one-sixteenth of an inch (1.6 mm) of the cast iron, resulting in a very smooth, glossy surface. A typical surface grinder is a sheel about 14 in (35.6 cm) wide consisting of a hard, abrasive material known as grinding rock. It spins at about 1,800 revolutions per minute as it grinds away the surface of the cast iron. 6 The polished cast iron components are assembled with steel bolts. The bolts are started by hand, then tightened by machine to ensure that the cast iron components are firmly bonded together with no leaks. Various other components, such as firebrick linings or catalytic converters, are assembled into the stove at the same time. 7 The completed stove is inspected again for any cracking, which may have taken place during the tightening of the bolts. It is then treated with oil to prevent rusting and packed with expanded polystyrene foam (a very light but strong plastic foam) into cardboard boxes to be shipped to the consumer. During the manufacturing of cast iron, the most important factor in producing metal with the desired characteristics is controlling the amount of elements other than iron and carbon present in the final product. In particular, the amount of silicon present produces two very different forms of cast iron. White cast iron (named for the bright surfaces seen when the metal is fractured) contains more than 2% silicon. It is not as hard as white cast iron but it is easier to cast and shape with machines. Gray cast iron is the material used to make cast iron stoves. During the assembly of the stove the cast iron components are inspected for pits, cracks, and rust. After bolting the components together the stove is inspected to ensure that the stove is airtight. This prevents smoke from escaping from the body of the stove rather than moving through the flues. When the stove is oiled to prevent rusting, it is inspected to see if any oil seeps through the metal, indicating that a crack is present. EPA regulations introduced in the 1980s required manufacturers of woodburning stoves to reduce the amount of emissions produced. Manufacturers have complied with these regulations in three ways. Some have installed catalytic converters, in which a ceramic honeycomb coated with platinum or palladium causes smoke to burn more completely. Some have created so-called "high tech" stoves, which improve existing technology so that fuel burns more efficiently. The most radical change is the development of pellet-burning stoves. Instead of ordinary wood, these stoves burn small pellets formed from wood chips, sawdust, bark, and other wood scrap, which is dried, pulverized, and compressed. Because they are much drier than ordinary wood, these pellets burn extremely cleanly. Pellet-burning stoves are also easier to use than traditional woodburning stoves. The owner only needs to purchase the pellets and load them into the stove's automatic hopper, which controls the rate at which fuel is added to the fire. This recent innovation in the technology of woodburning stoves ensures that the seemingly old-fashioned cast iron stove will continue to be used well into the twenty-first century. Adkins, Jan. The Art and Ingenuity of the Woodstove. Everest House, 1978. Sanders, Clyde A. and Dudley C. Gould. History Cast in Metal: The Founders of North America. Cast Metals Institute, 1976. Turbak, G. "A New Generation of Wood Stoves." Mother Earth News (December/January 1992): 66-70. Vivian, J. "A Clean Burn." Country Journal (November/December 1991): 60-64.